Auto companies have made great strides in improving engine efficiency in recent decades. But those improvements haven’t done much to improve the fuel economy of America’s passenger car fleet. Instead, consumers have “spent” most of those efficiency improvements on bigger, faster cars. [B]etween 1980 and 2006, the average gas mileage of vehicles sold in the United States increased by slightly more than 15 percent — a relatively modest improvement. But during that time, Knittel has found, the average curb weight of those vehicles increased 26 percent, while their horsepower rose 107 percent. All factors being equal, fuel economy actually increased by 60 percent between 1980 and 2006, as Knittel shows in a new research paper, “Automobiles on Steroids,” just published in the American Economic Review. This is a fine example of a very common phenomenon: consumers often “spend” technological improvements in ways that partially offset the direct effect of the improvement. If you make engines more efficient, consumers purchase heavier cars. If you increase fuel economy, consumers drive more. If you give hikers cell phones, they go to riskier places. If you make low-fat cookies, people eat more. And on and on. People really do respond to incentives. That’s good advice, as far as it goes. But it has a dark underside: managing the measurement rather than actual outcomes. While it is difficult to say how often crime complaints are not officially recorded, the Police Department is conscious of the potential problem, trying to ferret out unreported crimes through audits of emergency calls and of any resulting paperwork. The United States can’t pursue al Qaeda alone. We need help from other nations. To encourage nations to provide that help, the U.S. created the Coalition Support Fund to reimburse coalition partners for the costs they incur fighting terrorism. The U.S. and Pakistan are engaged in a billing dispute of sizable proportions, sparring behind closed doors over billions of dollars Washington pays Islamabad to fight al Qaeda and other militants along the Afghanistan border. Washington, increasingly dubious of what it sees as Islamabad’s mixed record against militants, has been quietly rejecting more than 40% of the claims submitted by Pakistan as compensation for military gear, food, water, troop housing and other expenses, according to internal Pentagon documents. Those records, reviewed by The Wall Street Journal, detail $3.2 billion in expense claims submitted to the U.S. for operations from January 2009 through June 2010. 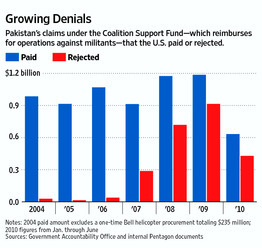 According to the documents and interviews with officials, Pakistan has routinely submitted requests that were unsubstantiated, or were deemed by the U.S. to be exaggerated or of little or no use in the war on terror—underscoring what officials and experts see as a deep undercurrent of mistrust between the supposed allies.